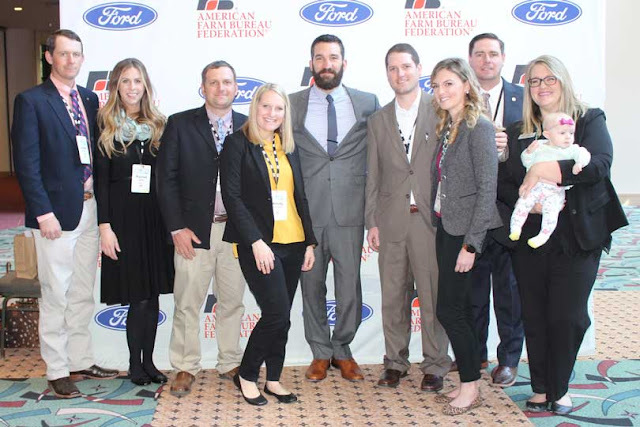 A group of young farmers and ranchers returned from the American Farm Bureau Federation’s (AFBF) FUSION Conference in Madison, Wisconsin, with a renewed focus and a larger network within the agricultural community. More than 1,000 participants, including Texas Farm Bureau (TFB) young farmers and ranchers, attended the annual conference. Among them were Cody and Melody Kneupper of Kendall County, Ben and Jessica Rumbaugh of Wharton County, Jesse and Karri Wieners of Carson County and Austen and Rachel White of Wilbarger County. James O’Brien of Bee County also attended the conference for a graduation ceremony from AFBF’s Partners in Advocacy Leadership program, and he led a breakout session on marketing. McKenna Bush of Brazos County participated in the Collegiate Discussion Meet. AFBF Vice President Scott VanderWal and motivational speakers Redmond Ramos and Jim Morrison addressed the attendees. The group also attended breakout sessions to hear from industry leaders on agricultural technology, entrepreneurship, social media and consumer engagement, among others. That grassroots leadership will strengthen state YF&R programs, including Texas’ program. “We are coming back more equipped and excited to put these ideas into practice in Texas,” she said. The conference was about more than presentations, though. It was an opportunity to develop leadership skills and network with other farmers and ranchers from across the country. To wrap up the four-day conference, the Texas group toured local dairy farms and Seneca Foods, one of the largest processors of fruits and vegetables in the U.S. But the learning won’t end with the conference. The young farmers and ranchers are leaving their mark on Texas agriculture and building a legacy to pass on to the next generation.